The fresh design, plus new mission statement and tagline, aims to show where the company is headed rather than where it’s been. The 2018 version of Avaya is significantly different than the ones we’ve seen in years past. Fresh off its emergence from bankruptcy, the company started the year as a publicly traded company, something it hasn’t been since 2007 when it was taken private by Silver Lake and TPG Capital. For the first time in 11 years, the company had a CEO who wasn’t Kevin Kennedy, with Jim Chirico taking that position. And in another something that hasn’t happened in years, the company has posted three consecutive quarters of bookings growth. In addition, Avaya this year has released a flurry of products and features, including 13 SIP phones introduced last Friday, Nov. 9. These phones work on call control from Avaya as well as Open SIP providers. The release of these phones marks a strategic shift for the company. Last May, it made a bit of noise about supporting endpoints from other cloud telephony providers, but released only one deskphone, one conference phone, and two Vantage phones. The new phones brings the total to 17, and Avaya said it plans to release more by the end of next year. Avaya displayed other innovations at the recent Gitex event held last month in Dubai. Avaya just last week announced that it’d brought in some new leadership with the addition of Gaurav Passi as head honcho for its cloud initiatives. This week Avaya added to its momentum with a new mission statement, tagline, and fresh look. That’s certainly a mouthful, but some points are worth noting. The first is the digital communications being powered by software, services, and devices. Avaya has always had a strong device portfolio, and it’s been rapidly shifting to a software-first model. In conjunction with this, Avaya has beefed up its services portfolio, which now includes consulting, solutions, cloud transition, and adoption services. I believe companies need to shift to a service-led engagement model, and Avaya will make a more concerted effort to highlight its services capabilities. For example, in the products and solutions dropdown menus on the website, the UC, contact center, and cloud subcategories now include a services component. Another notable point in the mission statement is the use of the word “open” in its solution description. Every vendor claims openness, but what does that really mean? Technically, a single API that’s open lets a vendor make that claim. The new Open SIP phones are a good proof of Avaya’s openness, as are its A.I.Connect and DevConnect developer programs, aimed at enabling third parties to build solutions that sit on top of Avaya software. This is a good start, but if Avaya wants to use this to differentiate itself, it will need to deliver continuous proof points. Lastly, Avaya states it is delivering its solutions from the cloud, on premises, or in hybrid deployments, and that’s the correct focus. In July, my advice to the company was to not compete on other vendors’ terms. Competing with RingCentral in public cloud is currently a losing proposition given the momentum and brand recognition the UCaaS provider has. Instead, Avaya’s strength is that it can deliver solutions any way a customer wants to consume them, and that’s where its focus could be. Avaya’s new tagline is “Experiences That Matter,” which plays off the “intelligent experiences” mention in its mission statement. I like the tagline because it’s simple and clear. Given the size of Avaya’s contact center and UC/telephony installed bases, it could argue that it has more knowledge of experiences than any other company. During a briefing, Becky Carr, head of global marketing at Avaya, likened the company’s knowledge of experiences to how Farmers Insurance markets itself -- “We know a thing or two because we’ve seen a thing or two.” Regardless of a business’s size or vertical, Avaya likely has familiarity with the experiences that matter. This tagline refresh is long overdue, the first change since the “Power of We” debuted in 2011. In addition to a new mission and tagline, the website got a facelift. Avaya’s old website was product- and technology-centric. 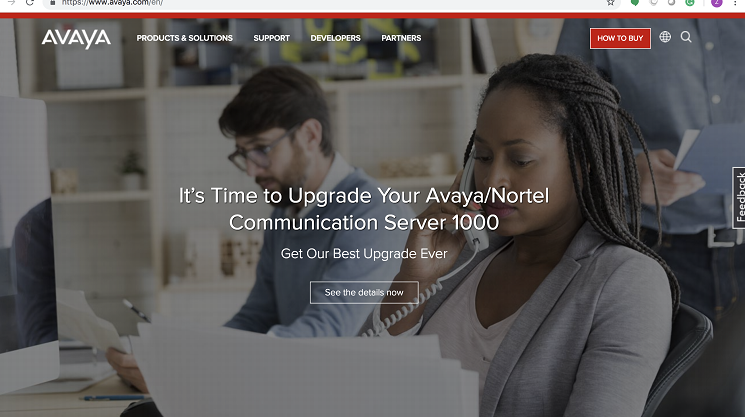 On Friday, I punched “avaya.com” into my browser to see what came up, and was greeted with a message about upgrading my Nortel phone system. What could be more product focused than that? The other issue with this is that it’s focused only on businesses that are running Avaya/Nortel Communication Server 1000, which is a very small segment of the overall business market. 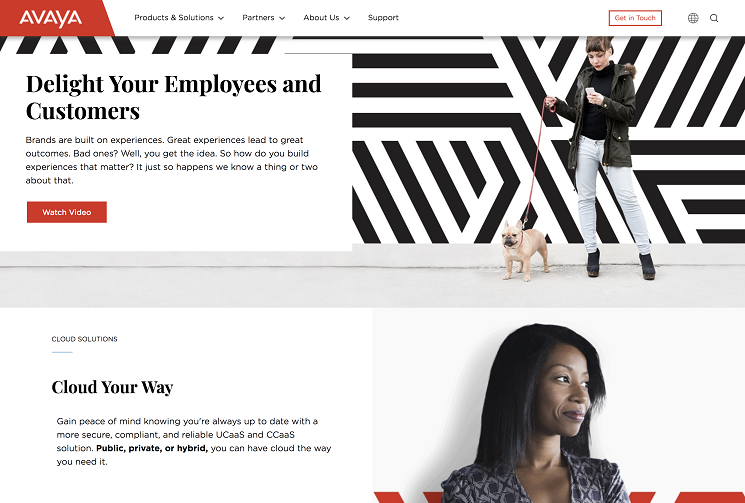 The new website is a fresh, more modern look with digital transformation examples scattered all over it -- and focuses on solutions rather than products. Another big change is that Avaya has simplified its solution taxonomy. Prior to the refresh, the product tab was a massive alphabetic listing of products, and unless you had intimate knowledge of them, finding anything was difficult. Avaya has lots of great ideas, but it’s never done an effective job of productizing these ideas. Now I’m expecting to see these start showing up on the new Avaya website. The mission statement, tagline, and website are just the beginning, said Carr, emphasizing that Avaya will get a new brand voice that leaves the past in the past. No more apologies or willingness to take a backseat to anyone. We should expect to see an Avaya that’s more confident, has more swagger, and that’s louder about its innovation. Most importantly, Avaya will be putting its customers first, which makes sense given it sells technologies that let businesses put their customers first. While Avaya just debuted the new website, it had the branding on display at its Gitex booth. The picture below is one example of the modernized design and messaging on display in the Avaya booth there. Avaya has changed a lot since Chirico took over, with new leadership, strategy, and delivery model. Now it’s changing its look to better reflect where it’s going instead of where it’s been.